When the glaciers of the peak, chilled air currents across the mountains and the beauty of the rocks invite us to relish the flavor of snow, most of us would prefer a quick guide to plan up our voyage to cuddle the Himalayas. This simplified trek guide minimizes your agitation. Read on! The above quotation reflects the inner feelings which dwell in every person who treks through the mountains. Himalayas is a chain beaded by series of ranges which turns out to be a well-framed architecture of nature. It serves as a mother, giving rise to holy waters of the Ganges, while the rock of the mysterious snow jungle is washed by many sparkling streams. We Indians feel proud to be gifted with the rock canopy symbolizing the aesthetic geological zone. The Himalayan cascade spreads its ravishing panorama to a lot more other countries as well. India is blessed with the nature’s asset that portrays various facets of lavish foliage whose gelid glaciers of the magical peak touch a part of the Indian subcontinent. At some point of time in life, every Human being envisions to hike through the great Himalayas and hug the summit- Mt Everest. Some only dream of it and form an opinion that reaching the peak could be a night mare, some dream of it and only decide to take the first step, while only few out of all the people, set their goal and give life to this dream by actually taking the very first step to start their tour over the Himalayan summit. They are the people who are unstoppable from achieving their dreams and goals. Here is a quick guide that lets you have a glance over the whole preparation needed to take a trek to the Mt Everest. Be positive and pace yourself: Making up your mind and setting it up for a challenging trek is equally important to your physical preparation. Your trekking mantra should be deep breathes, steady steps and an affirmed mindset. And don’t forget that your key to reach the summit is to never give up. After you make a strong decision to trek, collect complete information which makes your trip. Explore and research on internet, talk to people, watch videos, listen to the experiences of people who have already reached and returned from the summit, and go through articles and interviews of experienced mountaineers. Technology has improved so much that it can help you get a complete idea about how it feels in Himalayas. You can get information about climatic conditions and the hurdles to be faced while reaching the summit and the felling which amazes you when you make to the peak. Months of March until unset of monsoon, April, May and October are best suited for an Everest trek. In autumn, though it’s colder, that’s when popular Everest treks are the busiest. It is not recommended to visit Himalayas during monsoons. - Winter: Dominating; Day temperatures are comfortable and sunny skies prevail. But nights are frozen and are intolerably cold with snowfall. 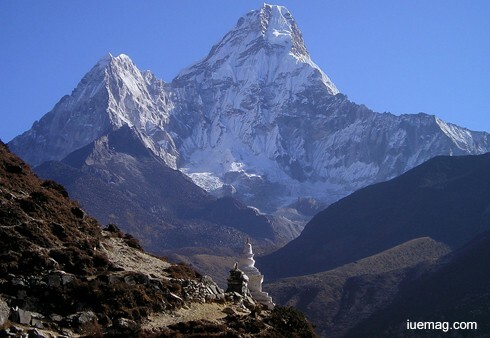 - Spring at Everest :Rain is infrequent and day temperatures are warm. - Monsoons at Everest :Summer weather is influenced by Indian monsoon which brings frequent rains, accompanied by cloudy weather. - Coldest temperature on the summit: -41 deg Celsius. - Everest summit is the windiest location on earth. Night time temperature: -7 deg Celsius. Typical expedition will last for about 2 months. After trekking several days to reach the Everest base camp, the process of gradual acclimatization on Mt Everest will begin. Until you are ready to try for the summit, teams go up and come down from higher and higher camps. This happens for 4 to 6 weeks before an attempt to summit is made. - Reach Kathmandu through your international flight. - Base camp 5400m/17700ft: It is a formula one car racing depot with all the comforts which gives you homely environment. - Icefall 5500m-6100m/18000ft-20000ft: This place is similar to a huge horror chamber at an amusement park. Be strong to face all the scary things which happen here: An ice pinnacle can fall on top of you or an avalanche may strike. - Camp 1, valley of silence 6100m-6400m: Flat area of endless snow. Climb time is 4 to 7 hours not acclimatized and 3 to 5 hours after acclimatization. - Camp 2 6400m/21000ft: Last rocky patch at the foot of the icy wall. - Camp 3, Lhotse wall 6800 – 8000m: 1200m high slope which requires careful roping to slide the dangerous part of the trek. Climbing time is 5 to 8 hours not acclimatized and 4 to 6 hours acclimatized. - Camp 4, the death zone 8000m/ 26000ft: plateau with vas glaciers. - Knife ridge: the most dangerous level you are supposed to overcome. - Many other various lifts. You have to walk up the hills with weighted pack and liters of water, which is essential to condition your cardiovascular tissues. Focus on training for shortness of breath at high altitudes so that you don’t get exhausted easily. In order to acquire a great start for your training, walking inclines on the treadmill with a weight vest is recommended. Running, rowing, cycling, swimming, walking up hills are impacting ways to build your endurance. Always wear your heavy weighted day packs while training. Use altitude masks to simulate your lung capacity and stamina. The key is to take short steps and walk slowly even when you have enough energy. General conditioning for mountaineering: hike step outdoor trails with water weights added to your pack. A physical goal must be 1067m carrying 15 to 20 kg’s in 2 – 3 hours. Increase the amounts of water in collapsible plastic jugs and slowly work up to 22 – 30 kg’s. Put on your boots and your day pack before you start your training. Train hard and trek slow. Always carry extra cash than what is required in order to conquer unforeseen costs which creep in your way. Get yourself insured and carry credit cards. Most common and serious issue that people suffer from is altitude sickness and acute mountain sickness. It affects when you reach above 2500m altitude. It is caused due to the less oxygen intake. You have to breathe faster and deeper to get oxygen into your body. Carrying supplemental oxygen cylinders would protect you from these health issues. Despite all the preparations you make and all the measures you take, enough strength must characterize every mountaineer to face the unexpected accidents, avalanches, heavy storms and snowfalls, and other realities which get revealed only when you reach high altitudes during the course of the trek. Proceeding with a positive attitude will surely help to make to the summit and return home safely. However, every aesthete deserves to attain the revitalizing experience of the transcending beauty essence. So what is the wait for? Set out and explore to imbibe the exquisite nectar of the paradise on earth.